Santa Rosa, Calif.—As water demands continue to increase throughout California amid new orders from the State to cut use, a public awareness and education campaign was launched today in Sonoma County sponsored by a unique partnership involving local winegrape farmers, the business community, the Sonoma County Water Agency and the Sonoma Marin Saving Water Partnership to inform residents on how to conserve and reduce water use. Far from a “water war”, the Sonoma County Drought Relief Partnership is a public/private community-driven effort to communicate simple, effective ways to conserve water during the year’s hottest months. In addition, each participating organization will distribute drought education materials to their members and the general public as well as challenge their members to promote water conservation. The goal is to broadly communicate best practices and tips throughout the region so water conservation becomes a normal everyday behavior much like recycling. Grapes are a very efficient crop with regard to water and do not require much irrigation. A normal weather year results in 25 – 60 inches of rainfall in the County’s winegrape growing areas. 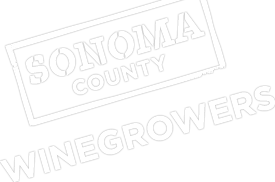 Grape irrigation uses only 3-6 inches per year in Sonoma County so that remaining water accumulated in the rainy season goes back into the ground and recharges the aquifer.